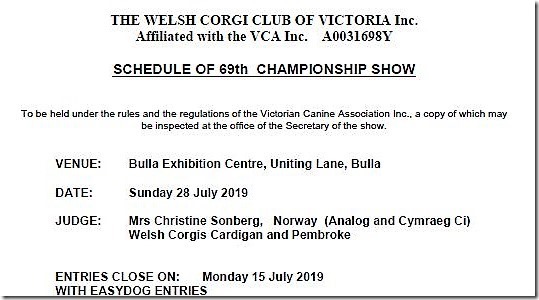 The Welsh Corgi Club of Victoria is proud to announce the details of the 69th Championship Show – July 2019 [PDF]. Mrs Christine Sonberg, Norway (Analog and Cymraeg Ci) (Cardigan and Pembroke) has accepted our invitation to judge this event. The 69th Championship Show will being held at Bulla Exhibition Centre, Uniting Lane, Bulla, VIC, 3428, on Sunday, 28th July, 2019. Further details are included in the 69th Championship Show Schedule [PDF]. This show will be the Club’s main show for 2019, the November show will have a local judge. Entries close on Monday, 15th July 2019, so update your calendar so that you can join us on the day! We look forward to seeing lots of Welsh Corgi enthusiasts there. 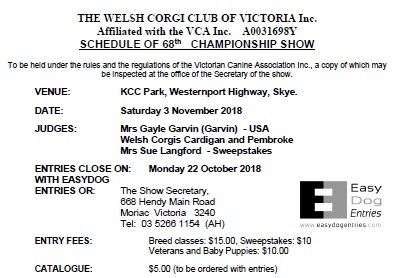 The Welsh Corgi Club of Victoria is proud to announce the details of the 68th Championship Show – November 2018 [PDF], our traditional championship show. Mrs Gayle Garvin (USA) of Garvin Corgis (Cardigan and Pembroke) has accepted our invitation to judge this event. The 67th Championship Show will being held at KCC Park, Skye on Saturday, 3rd November 2018. Further details are included in the 68th Championship Show Schedule [PDF]. Entries close on Monday, 22nd October, so update your calendar so that you can join us on the day! 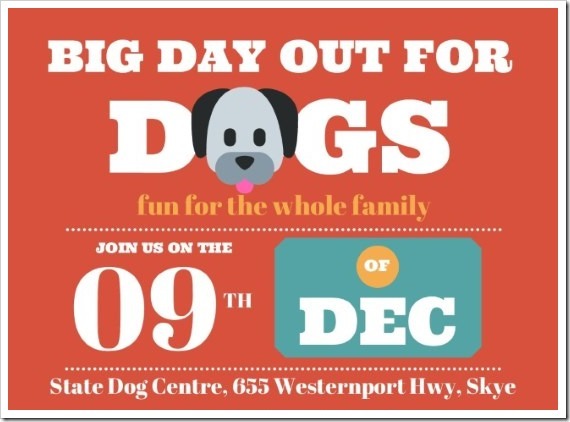 We look forward to seeing lots of Welsh Corgi enthusiasts there. 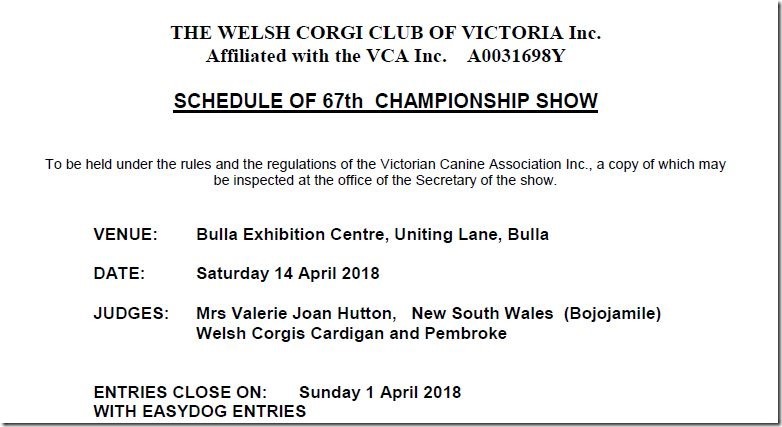 The Welsh Corgi Club of Victoria is proud to announce the details of the 67th Championship Show – April 2018 [PDF]. The Welsh Corgi Club of Victoria would like to inform Corgi exhibitors that our April Show judge, Mrs Carole Vaughan, is unable to fulfil her appointment due to health reasons. Although we are disappointed that Carole cannot be with us, we are pleased to announce that Mrs Joan Hutton has accepted our invitation to judge the show. Entries close on 1 April, so please get them in so you can join us on the day! 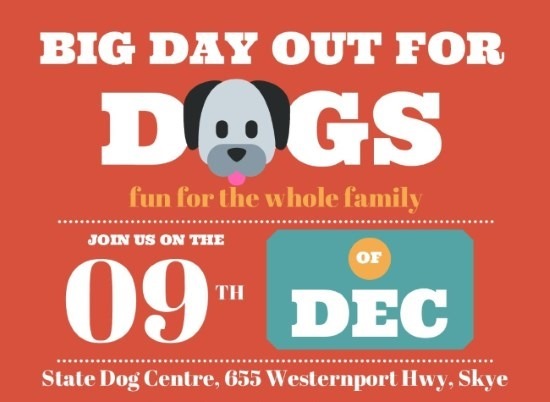 We look forward to seeing lots of Welsh Corgi enthusiasts there. The 67th Championship Show is being held at Bulla Exhibition Centre, Bulla on Saturday, 14th April 2018. Further details are included in the schedule [PDF]. To qualify for this award, your Corgi must have reached the age of 10 years by 31st October 2017. Your Corgi will receive a certificate that will be presented at the Club’s Championship Show on Saturday 4th November at KCC Park, Skye. Please include a copy of your dog’s registration certificate to verify their date of birth, and a photograph together with a short commentary about your dog. Don’t forget to include their call name. The photo and comments will be included in a future edition of the Chatter. The oldest of our Living Legends will receive a special trophy from the Club. The Welsh Corgi Club of Victoria is proud to announce the details of the 66th Championship Show – November 2017 [PDF]. This is our traditional Championship Show. The 66th Championship Show is being held at KCC Park, Westernport Hwy on Saturday 4th November 2017. Mr Tim Matheson (Nebriowa – USA) is our Championship Show judge. Ms Lisa Berrill (VIC) is our sweepstakes judge, sweepstakes will be held before the Championship Show. Further details are included in the schedule [PDF]. The April 2017 Championship Show has just finished, and we were blessed with good weather, a marked contrast to last year’s mid-year show. Our thanks go out to our judge, Ms Lisa Carpenter (QLD), our exhibitors and their dogs, and all the other people that came along to see show Corgis do their thing. (Best In Show, Cardigan, Pembroke, Cardigan Classes, Pembroke Classes).